BFA ’16 Laura O’Connor, recipient of the Exceptional Opportunities Award, spent three weeks in the Peruvian Amazon working with the Loreto Regional Artesanía Taller. 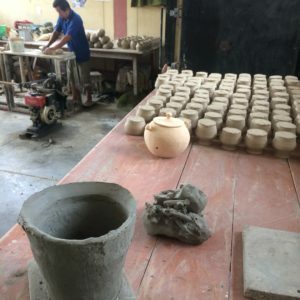 This ceramic studio, run by Gustavo Romero de la Cuba, functions as a workshop and a a cultural preservation site. During my time there, I researched ceramic water filter fabrication methods, both native and foreign, that the community has experimented with. Simultaneously, I spent time recording major changes in the Kokama ceramic tradition that have happened in the past three years- since my first visit with the community- which have been substantial. These findings and experiences are being used towards my studio practice as well as providing useful information for local NGOS/ sustainability groups to utilize on their path to building a more sustainable Amazon. Laura is currently a 2016-2017 Fulbright Fellow in Madrid, Spain.